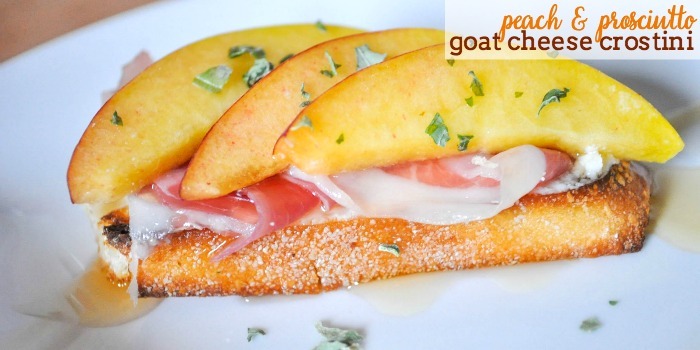 A fresh and easy appetizer – Peach Prosciutto Goat Cheese Crostinis! We somehow make a lot of appetizers in our lives. Between friends coming over, days at my parents’ pool and cocktail hours with my in-laws when they visit, I make a lot of snacks and appetizers. I’m always trying new ideas, but I never want to try something too complicated. They can look complicated but I don’t want to be spending too much time actually making them. 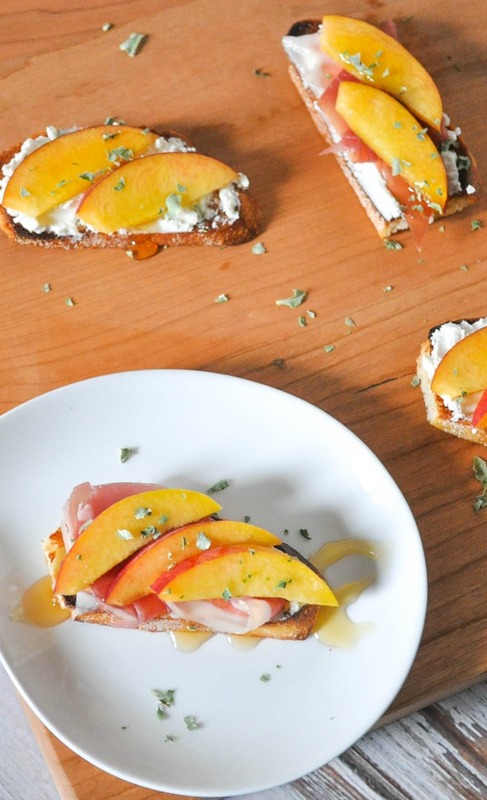 These Peach Prosciutto Goat Cheese Crostinis are exactly that. They look so pretty all lined up on a plate together, but they are so easy to make and fast, too. The hardest part of the whole process is making the crostinis without burning them, but that is probably because we have the most temperamental oven. So – what is a crostini one of you might ask? It’s just a fancy name for baguette slices brushed with oil and toasted until golden brown. They are the perfect base for tons of hors d’oeuvres. Just spoon on your pick of toppings and watch the crostini disappear! 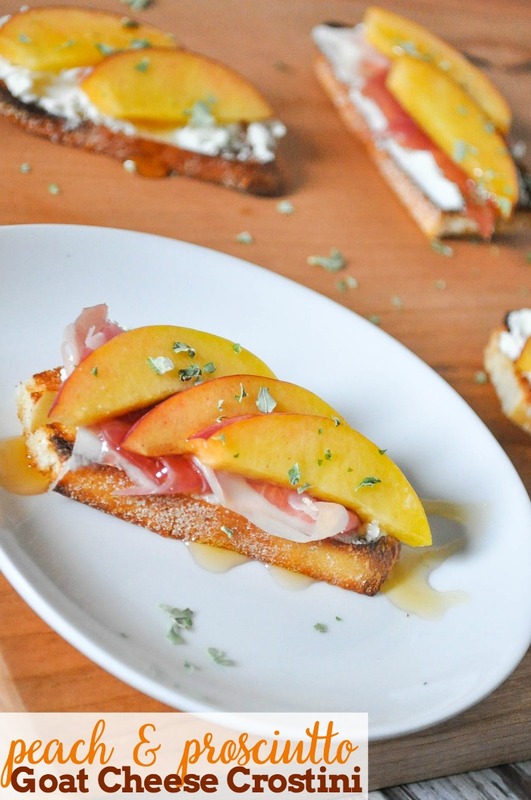 For this particular hors d’oeuvre, after making the crostinis, you add goat cheese, prosciutto, a little honey, then top with peaches. EASY! To make the crostinis, preheat the oven to 375° F. Brush the bread slices with the olive oil and arrange them on a baking sheet. Bake 7 to 12 minutes or until golden. Remove them from the oven and let them cool to room temperature. Spread a layer of goat cheese onto the crostinis. 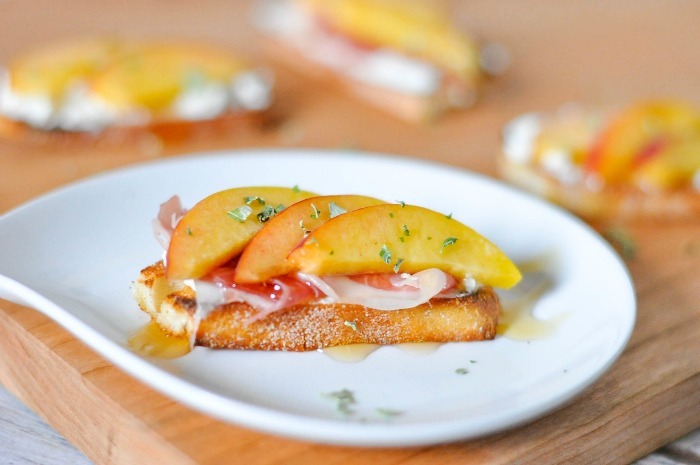 Cut your peaches into thin slices and add to the top of the crostinis. What do you like to top crostinis with? Do you have a favorite combo?